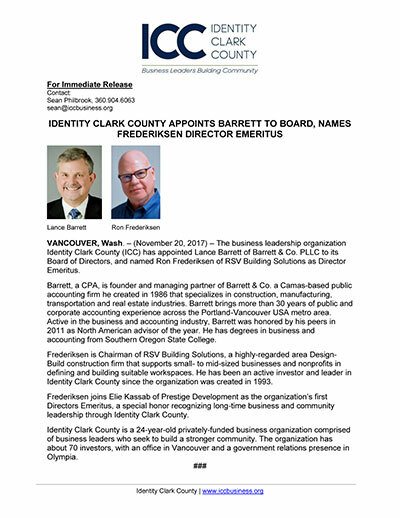 The business leadership organization Identity Clark County (ICC) has appointed Lance Barrett of Barrett & Co. PLLC to its Board of Directors, and named Ron Frederiksen of RSV Building Solutions as Director Emeritus. Barrett, a CPA, is founder and managing partner of Barrett & Co. a Camas-based public accounting firm he created in 1986 that specializes in construction, manufacturing, transportation and real estate industries. Barrett brings more than 30 years of public and corporate accounting experience across the Portland-Vancouver USA metro area. Active in the business and accounting industry, Barrett was honored by his peers in 2011 as North American advisor of the year. He has degrees in business and accounting from Southern Oregon State College. Frederiksen is Chairman of RSV Building Solutions, a highly-regarded area DesignBuild construction firm that supports small- to mid-sized businesses and nonprofits in defining and building suitable workspaces. He has been an active investor and leader in Identity Clark County since the organization was created in 1993. Frederiksen joins Elie Kassab of Prestige Development as the organization’s first Directors Emeritus, a special honor recognizing long-time business and community leadership through Identity Clark County.